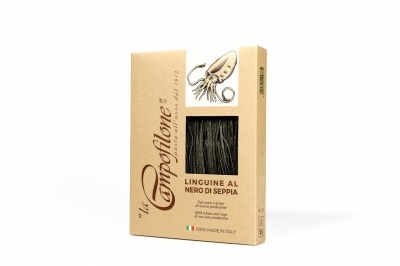 Why not trying the special egg pasta "La Campofilone"? You will surprise your guests with extraordinary dishes! Squid ink linguine, Mushrooms Fettuccine, Chili Pepper Fettuccine, Sage Fettuccine, Spinach Fettuccine, Lemon Fettuccine, Orange Fettuccine. Made with selected natural ingredients, then added to the dough of eggs and semolina, this special egg pasta will enhance the simplest tastes and will amplify the savour of rich sauces.